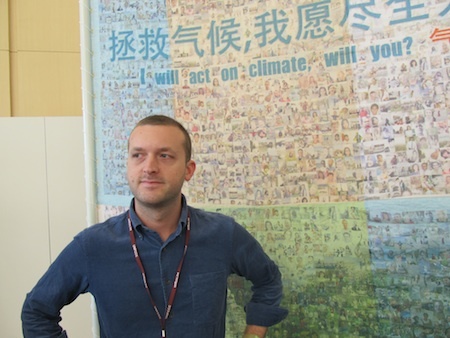 TIANJIN, China – In almost every way – timing, media coverage, official attention, and spirited engagement — the brief morning event to open the climate conference here was a triumph for its organizers — the Global Campaign For Climate Action (GCCA), Tck tck tck, and Greenpeace. The stamping of a symbolic Great Climate Wall of China with a Chinese proverb also was another satisfying example of leveraging art in the public interest for the Great Wall’s creator, 26-year-old sculptor and fine artist Joseph Ellis. Ellis, an American raised in upstate New York, has lived and worked in Beijing for five years, during which he became the first Westerner to graduate from the Central Academy of Fine Arts’ prestigious sculpture program. His work is colorful, creative, dynamic and fresh, just the sort of artistic message distinctive enough to generate commissions and a handsome living, attract a New York Times profile earlier this year, and earn him a TED Fellowship, one of 20 awarded from the more than 5,000 candidates who applied. His work also attracted Greenpeace, which worked with Ellis two years ago to design and execute an hourglass presented to Secretary of State Hilary Clinton during a climate action demonstration at the U.S. Embassy in Beijing. In 2009, Greenpeace funded Ellis to execute 100 life-size sculptures of children carved from ice for another climate action event.